Previously, I wrote a blog about creating small food plots without heavy equipment. While these plots can provide some nutrition, their main purpose is providing locations to harvest deer. With that in mind, I hope to share some of the critical steps that need to be taken to be effective when hunting small food plots. Probably the biggest key to having success while hunting small food plots is clean access routes to and from the plot. These plots are typically placed within cover, adjacent to where deer are likely to be bedding. This is the biggest upside to these plots, as this feature encourages daylight movement. It also leads to access issues, as bumping deer from these plots will negatively influence their use of the cover where you are trying to hunt them. The small size of these plots tends to encourage deer to feed for a short while before moving on, which makes entry and exit a little easier. The close quarters of these plots requires a plan, however. The first step to having clean access is wind direction. Obviously wind direction is important when in the stand, but the key is to avoid blowing deer out of bedding on the walk in. Once scent is considered, having a visual block when entering the stand is a must. The most effective way to do this is to use the thick cover around these plots to your advantage, and to incorporate a bend in the trail prior to reaching the stand. Having the ability to “peek around the corner” before entering the plot is very helpful. A final step that may improve access is the use of a ground blind to hunt from. If these plots are positioned within thick cover, the only suitable stand trees may cause you to be skylined. Even if that is not the case, a blind allows you to walk in directly behind it, leaving no chance for a deer to see you. I prefer a treestand for most of the hunting that I do, but a ground blind can work wonders to prevent being seen during the final approach to a small plot. 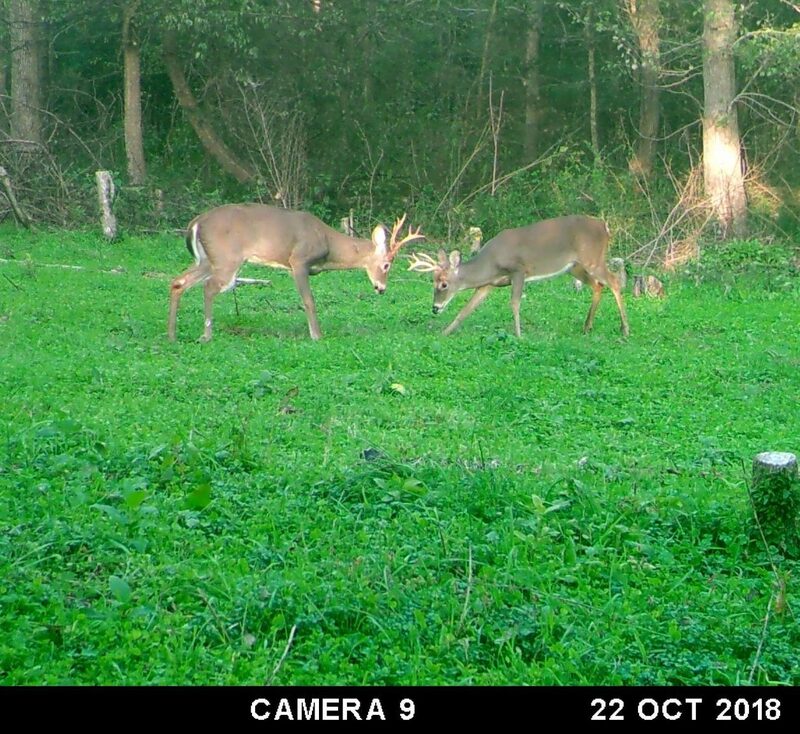 (Above) While these aren’t shooters, their behavior highlights the social hub that small food plots can become during the pre-rut and rut. After clean access is developed, it is time to figure out when to hunt these plots. Despite most hunters focusing on food plots in the evening, small food plots can also be hunted in the morning effectively. Doing so simply requires that you know when deer are going to be in the plot, as well as where they are coming from. 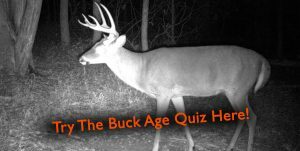 Even if you plan to hunt in the evenings, it is important to know when they will be hitting the plot, as it may be earlier in the afternoon than you might expect. The best way to monitor deer activity is to place a trail camera over the plot. This is a simple concept that many are already doing, but small plots are probably my favorite locations to hang cameras. In addition to showing what deer are using the plot, they allow a savvy hunter to time his entrance and exit to avoid spooking deer. Deer use of these plots is often at a fairly consistent time, and knowing this time is critical to success. The only downside to having a camera on the plot is that you have to force yourself not to check it with the wrong conditions, as doing so can result in deer being blown out bedding cover. The clean access that was developed for hunting also aids in checking trail cameras on small food plots. 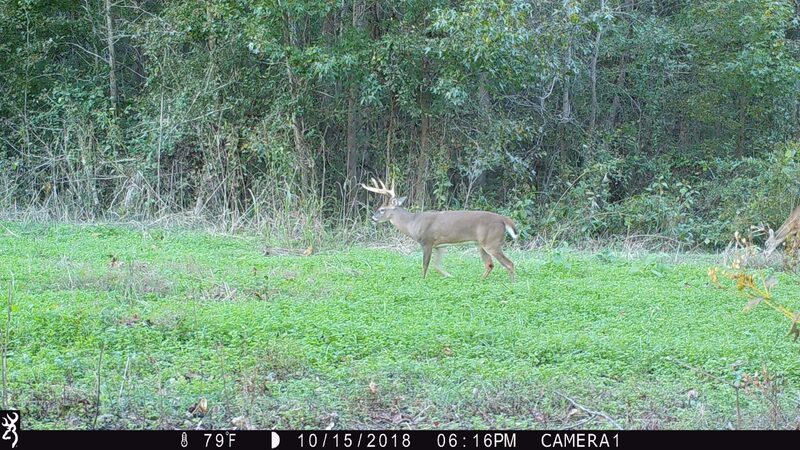 (Above) This buck is visiting this plot comfortably during daylight, and having a camera allows us to take advantage of these opportunities to harvest bucks before the rut. I believe that hunting small food plots can greatly increase success, but only if done correctly. Through proper access and trail camera monitoring, I hope that you are able to find success on that kill plot you planted for this fall!